Taking off my makeup after a long day of work can be a hassle especially when you are tired. It just seems like way more work. However, we should never fall to sleep with make up on. Washing our face is the first step to healthy skin. I have been using Neutrogena fragrance fee make up remover wipes and the Deep Clean Gentle Scrub everyday for the past week and I am loving how my face looks and feels since using them both together. 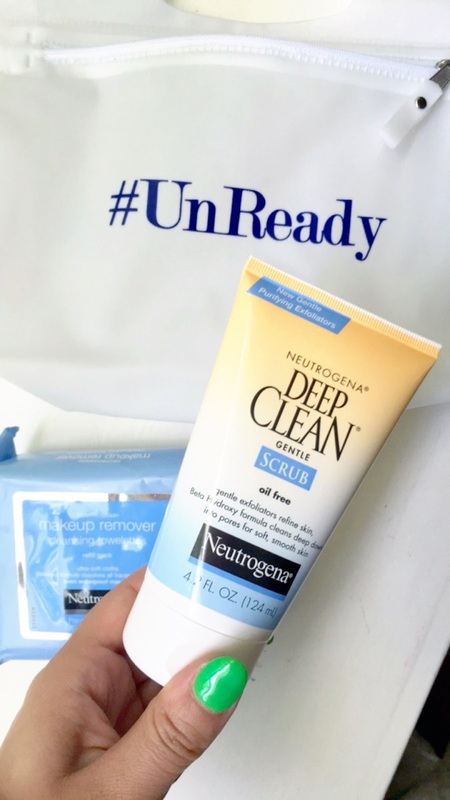 The Neutrogena Double Cleansing Method is the best way to get #unready every night because it gives your skin the most complete clean. The wipes are fragrance free, and what I like most about them is that I can wipe off my eye makeup including the water proof mascara that we wear during the summer. The Scrub is oil free and won't clog your pores. Its gentle enough to use everyday.